OK, folks, here you go..the final update for Vol State. In Westbrook’s words he, “crashed and burned.” In reality, he was doing well with fewer breaks than in prior years and moving right along. He took a break in Manchester, TN to wait out a storm and eat a little. Not sure if it was gradual or all of a sudden but the back pain hit (similar but different than Peach State 300). He ran a little further out but continued to feel shooting pain with every step he took, so he had to walk back into Manchester. 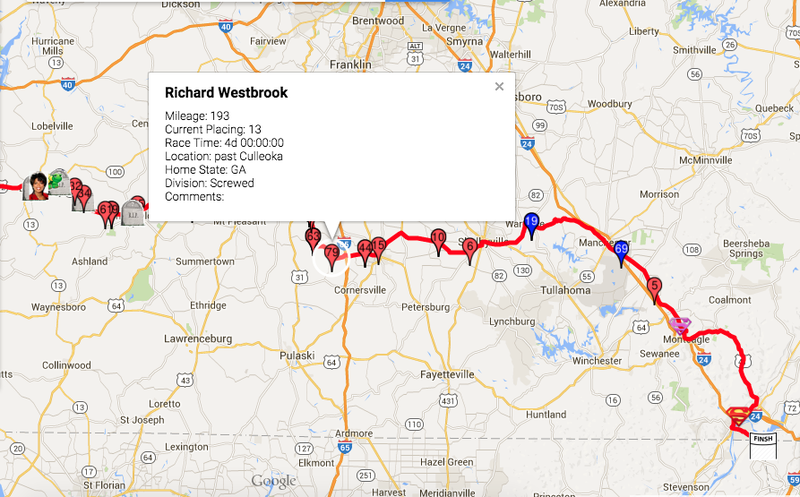 He finished with a completion of 257 miles. There remained 57 miles to go until the end of the race. We had to pick him up as the storm made it’s way to our house and knocked out all of the power and internet for a little too long. So, after running so far and ending in pain, he had to come back to a house with no power. 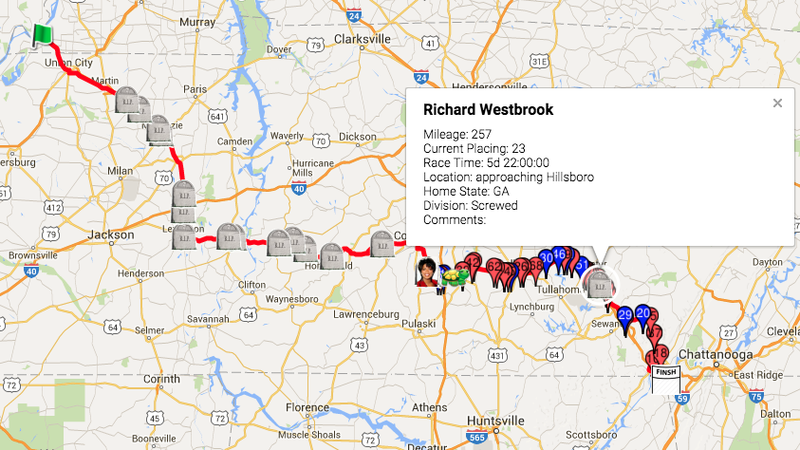 As of the end of day 5, Westbrook has covered 227 miles and is past Shelbyville, TN. He has slipped into 12th place in the screwed division consisting of 45 other runners. Overall, the crewed and unsupported runners total 61 with Westbrook holding 16th place. Only 87 miles to go until the FINISH! Day 5 and Westbrook maintains 9th place out of 45 unsupported competitors. 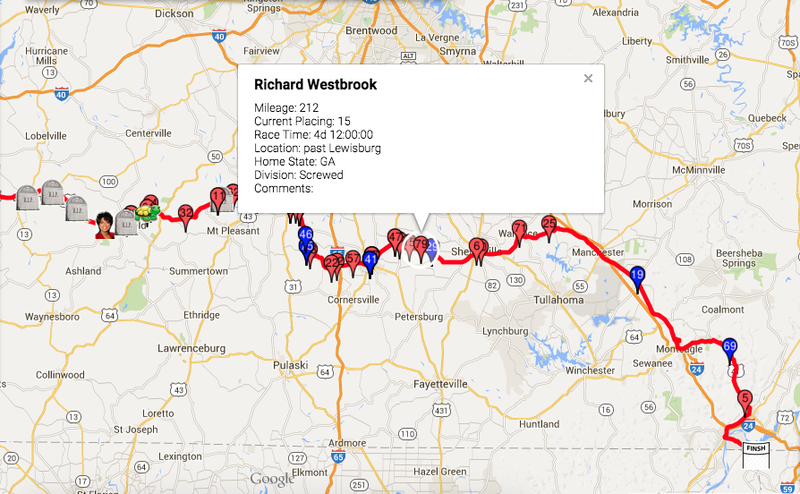 He has completed 212 miles and is past Lewisburg, TN. Just over 100 miles to go. Keep it up, Westbrook. We are cheering you on. Westbrook is definitely feeling better and moving along. 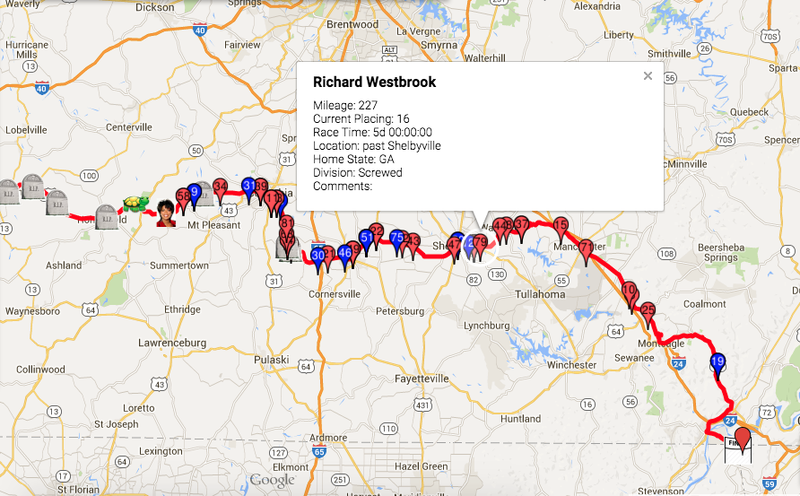 He has covered 193 miles and is just past Culleoka, TN. In the screwed (unsupported) division he is holding 9th place. Way to go! In the screwed division, Westbrook is holding 12th place with one other runner. More unsupported runners dropped out of the race…4 more to be exact for a new total of 45. 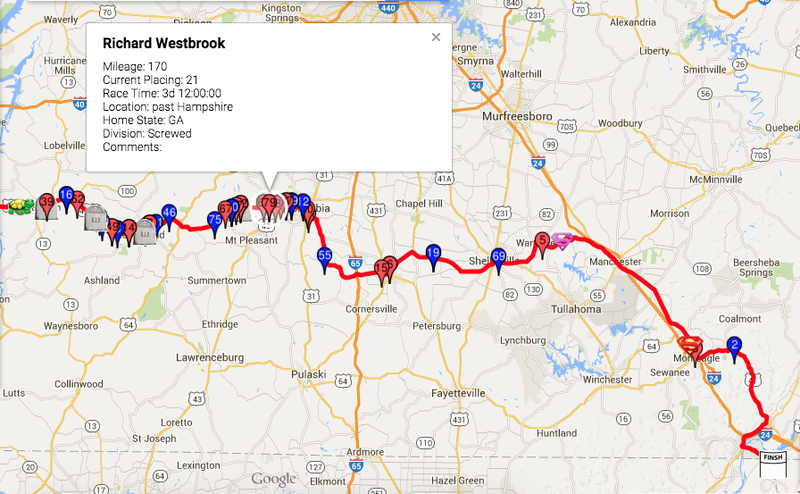 At this point, Westbrook is past Hampshire, TN with 170 miles behind him. Less than halfway to go, yay! 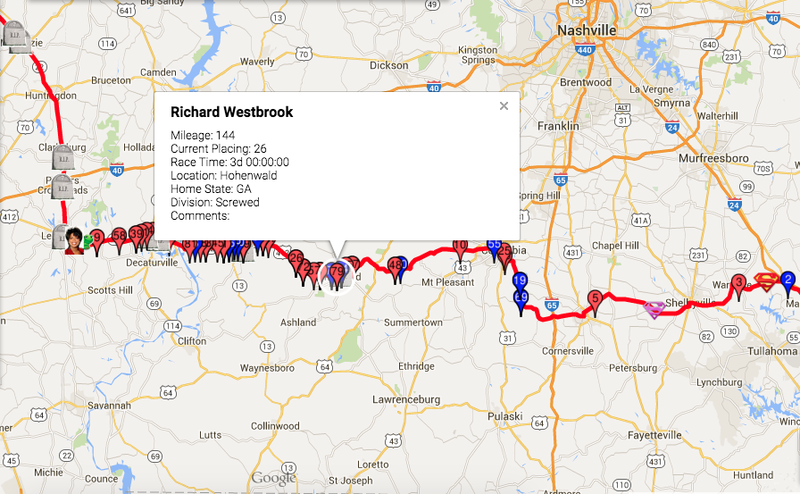 After 3 days complete, Westbrook is taking a break in Hohenwald, TN with 144 miles behind him. He had some difficult times, only being able to keep some V8 juice down and vomiting anything else up. I am sure the heat tends to get to everyone out there suffering through it. The heat index today is going to be 105 degrees. 4 more screwed runners have quit leaving a total of 49. Westbrook is currently 16th place tied with 3 other people. Pray he makes it along in the extreme heat today without any more issues.